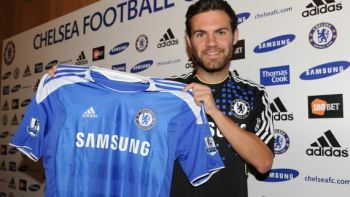 Chelsea have completed the signing of Juan Mata on a five-year deal. Mata will be available to play against Norwich City on Saturday having already trained with the squad. After four years at the Mestalla, in which he scored 43 times in 179 appearances, Mata spoke with Andre Villas-Boas and was convinced Stamford Bridge was the place for him despite interest from other clubs. "Right from the first moment there have been good feelings all around me," Mata told chelseafc.com "Training has been great and the players are a great group to train with. Valencia was a big club anyway, but I have left to join a bigger club, and it is all about the opportunity to win trophies and I have that here." The 23-year-old left-winger is the third Spanish player to join Chelsea this year. Fellow World Cup winner Fernando Torres joined from Liverpool last season and midfielder Oriol Romeu signed from Barcelona this month. Mata has 11 caps and been a mainstay of the Valencia side since 2008 with his speed and goals marking him out as one of Europe's most exciting wide men.